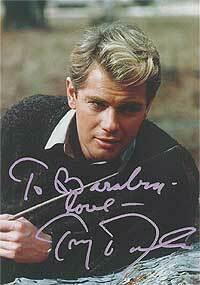 This segment is reserved for your stories and articles about Troy Donahue. If you have a story about Troy that you think may be suitable for publication on these pages, please and send it to me as email text (not as an attachment). Some of your stories will undoubtedly revolve around meeting and/or talking with Troy, but I am happy to consider anything else that you think may be relevant. You are also welcome to send photographs ... but no more than three per story, please. to send your own Troy Story. I look forward to reading it! As for the guestbook, unfortunately it has been closed down due to spammers. I'll look into finding an alternative as soon as possible. 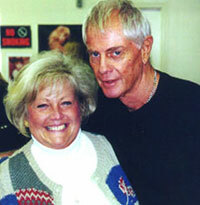 He was one of the guest celebrities signing autographs at an antiques and collectibles show in Gaithersburg, Maryland outside of Washington, D.C. in October 2000. He looked wonderful, stunning in fact ... very tall and slender, dressed entirely in black, with gray hair and incredible blue eyes.